When to Replace Your Garage Door - Overhead Garage Door, Inc. Replacing a garage door can cost you, on average, more than $1,000. It’s why many homeowners opt to try and repair their garage doors whenever they have garage door problems. However, there are some instances in which it’ll be a better idea to replace your garage door rather than attempting to repair it, regardless of the cost. By replacing your garage door, you will ensure that it will work the way it’s supposed to. You will also prevent safety issues from plaguing your home and putting you and your family at risk whenever you open or close your garage door. Here are some of the signs that will let you know it’s probably time to deal with your garage door problems by having your garage door replaced. Stand in your driveway and take a look at your garage door. Does it have panels on it that are broken? Are there other panels that are missing? Is your garage door splintering in certain areas or sitting unevenly on your garage floor because of damage that’s been done to the door? Over time, one of the garage door problems you’re going to face involves damage done to the door. Some of this damage can be fixed, but you’re only going to be able to put Band-Aids on your door for so long. Eventually, the damage is going to be too much for you to take, and your only option will be to replace your garage door altogether. When you open or close your garage door, it should move smoothly. If it’s very herky-jerky and vibrates all over the place when you put it up or down, there is definitely something wrong with it. In some situations, you might be able to make a repair to your garage door to get it to stop vibrating. However, in others, you will have to replace your entire door. It’s best to have a garage door company inspect your door to see if it can be repaired. If not, it’ll be time to replace it. If your garage door is vibrating when you open and close it, it’s also likely making a lot of noise. But garage doors can also make noise even when they appear to be running smoothly otherwise. A garage door company can usually quiet down noisy garage doors. But if your garage door problems are beyond the scope of repair, you may need to consider garage door replacement. The safety eyes on your garage door are in place to prevent your door from coming down when someone or something is in the door’s path. 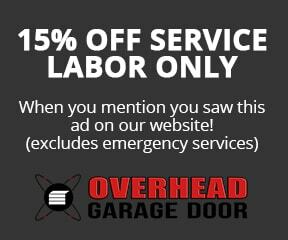 They’re there to make your garage door safe and to help you avoid accidents. If you notice that your safety eyes don’t seem to be picking up on potential obstructions and stopping your door from coming down, you have a big problem on your hands. You will need to have your safety eyes checked right away to see if they can be repaired or adjusted so that they work better. You should not, under any circumstances, continue to use a garage door that has non-functioning safety eyes on it. Someone could end up getting hurt as a result of your garage door problems. How easy would it be for someone to open up your garage door and access your home if they tried? It should be just about impossible for anyone to lift your garage door right now. It should also be impossible for them to break through the door due to damage that has been done to it. If your garage door isn’t providing your home with enough security at the moment, replacing it is really your only option. Many older garage doors aren’t equipped to keep homes secure. They’re easy to pry open and have panels that are simple to manipulate. If your garage door falls into this category, you should consider replacing it soon to keep your home and your family safe. When people pull up in front of your home, is your eyesore of a garage door one of the first things they notice? If so, you should try and change the appearance of it. That might mean painting it so that it’s a different color. Or it might mean replacing it so that it complements the rest of your home as opposed to bringing its aesthetic appeal down. Many homeowners fail to realize just how important the appearance of their garage door really is. If your garage door doesn’t look right, it could bring down the look of your whole home and limit its potential. This can hurt those trying to sell their homes, as a shoddy garage door could drag down the value of a property. But it can also hurt those who simply want to take pride in the way their home looks. Are Your Garage Door Problems Officially Out of Hand? If your garage door problems are starting to give you a major headache, you should have garage door replacement done right away. It’ll give you a garage door you can count on to work properly and secure your home. Take a look at our blog to read about some of the different garage door options you have.